Why Organization Development? It’s all About Organizational Health. I am not surprised when business professionals and decision-makers don’t know what Organization Development is. Saying this won’t make me popular in OD circles, but we OD practitioners do a poor job of explaining what we do. Sometimes we tell you that OD is just “HR on steroids.” Most frequently we try to sell you solutions—splashy tools for team-building, leadership development or communication skills training. At best we make claims about change management and call ourselves change agents. Oddly at times we just decide not to tell you what we do; it is amazing how often someone on one of the online OD discussion groups I belong to advises not explaining what OD is because it just confuses you! When we can’t (or won’t) explain OD, when we equate OD with HR, or when we focus on selling tools and pre-fab solutions, then we fail to offer you and your company the one thing of unique value that OD has to offer: improved organizational health. In The Advantage: Why Organizational Health Trumps Everything Else in Business, Patrick Lencioni explores the advantages that organizational health provides. Healthy organizations are better places to work, and they consistently outperform their peers. They are more profitable and have higher levels of growth and customer retention. Over the long-term, healthy organizations are more sustainable. Lencioni describes an organization as healthy when it is “whole, consistent and complete, when its management, operations and culture are unified.” Simply put, everything fits. You know why your company exists—and so does everyone else in the company. You have the right people in the right jobs—and they know what their jobs are, know how their jobs fit with other jobs in the company, and how their jobs contribute to your company’s reason for being. Everyone knows what success looks like and what is important for achieving that success—and everyone has the tools and resources they need to succeed. People, structures, processes and culture all work together to move your company towards achieving its reason for being. Relationships and communication—both inside your company and between your company and any outside stakeholders (customers, clients and vendors)—work in ways that help you reach your reason for being. Healthy organizations may be more profitable, but Lencioni is right when he says that achieving organizational health “requires real work and discipline, over time, and it must be maintained.” Achieving organizational health is not easy. At its core OD is about working with you to improve the health of your organization. When OD practitioners are really doing OD work, here is what they do. Assessment/Analysis: First an OD practitioner works with you and your employees to gather information about your organization and then analyze the data collected. Genuine OD work is always data-driven. 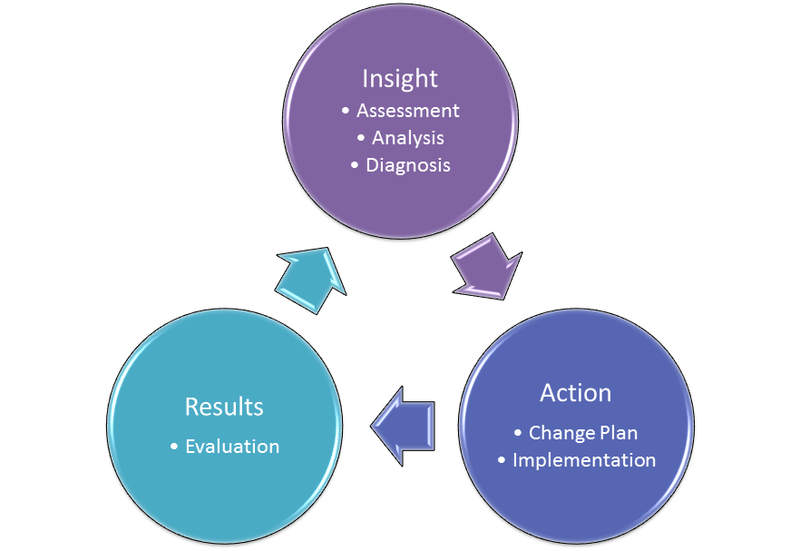 Diagnosis: Then an OD practitioner works with you to review the data and analysis to help you identify the strengths and weaknesses of your organization—where things “fit together” and where they don’t—and then to help you identify your goals for becoming a healthier organization along with what resources are needed and available. Treatment/Change Plan: Next you and the OD practitioner work jointly to define a specific, detailed plan of action that capitalizes on your company’s strengths, addresses weaknesses and moves you toward your goals for becoming a healthier organization. The “Treatment Plan” will include a wide variety of elements—possibly process improvements, cultural changes, or even some of those glitzy tools for team-building, leadership developing, communication skills training or diversity improvement that consultants are always trying to sell you. A successful plan requires two things. First, everything in the plan must be data-driven. You don’t do something just because it is trendy or because you read an article in a magazine on a plane. Second, the OD practitioner must have a grasp of the change process and change management. Remember: 70% of change efforts fail (Kotter, ” target=”_blank”>Leading Change). Implementation: Then you, members of your organization and your OD practitioner work together to implement your plan. Evaluation: Throughout implementation and afterwards, an OD practitioner works with you to evaluate what is happening. Is your company actually changing? Is your company learning? Are the changes actually improving the health of your organization? What more is needed? This keeps you from getting off track, allows you to capitalize on success, and enables you assess ways of further improving your organization’s health. That’s what OD is and what OD practitioners do when they are really doing OD—helping you improve the health of your organization—and not just offering you programs and solutions. Posted in Organization Development (OD). Tags: corporate culture, healthy organizations, John Kotter, organization development, organizational health, Patrick Lencioni. Comments Off on Why Organization Development? It’s all About Organizational Health.